The picture above details exactly what the caliber of my around-the-house handyman skills are. Which lead me to a weekend of multiple stops at hardware stores with iPhone photos of my situation, a Giant Eagle plastic bag of random plumbing pieces and spigot pieces, in my 1979 Village People Construction Worker costume (to make me look like I knew what I was doing) and a tape measure clipped to my waistband. For the record, yes, my tape measure has pencil markings on it from the last project when I had to count the 1/8 notches. The spigot thingy broke off the tub/shower. Hey it’s 20 years old. It screwed off which, in MY thoughts, put my DIY expected competency at a 9 out of 10 given the new thingy would probably just screw on! BOOM! The holy grail rack of replacement thingies from which to choose. I ask Home Depot rep #2, who was really cool, for help. He says he needs to refer to the plumber aaaaaaaaaaaaaaand guess who the plumber is….YEP.. the guy that just walked me to the spigot thingies that was headed to lunch hoping to not answer questions! Home Depot rep #2 took my stuff back to consult with the lunching-no-questions-plumber who said the pipe at home had to be re-plumbed. My dreams of being a successful DIYer on this project are now shattered, DIY expected competency level is zero and testosterone level is zero. Since I didn’t want to bother the lunching-no-questions-plumber at Home Depot any further, I headed to Lowe’s to see if maybe their plumbers don’t eat lunch or are more helpful with un-handy-men like me. Lowe’s Guy explains to me that the installation by Ryan Homes, 20 years ago, was kind of a short cut and not 100% correct. And then proceeds to use random pieces and parts, including a few Lego blocks and Lincoln logs, to show me how this can work. Boom! Mission accomplished. Fortunately for me I only had to make 2 trips to the God-forsaken-kingdom of driving jagoffery (Robinson Town Center/North Fayette) to get it done. The shower is fixed. My internal assessment of my DIY competency is back to a 7 out of 10 because the shower now works and there is no water on the lower floors, yet! So to the guy at Lowe’s who spoon fed me in Baby-DIY terms, THANK YOU! To Ryan Homes, thanks alot for the shortcuts 20-year ago. 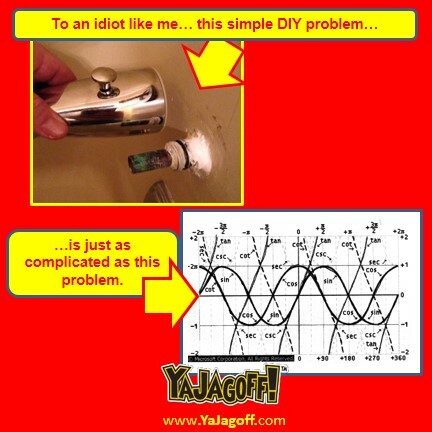 And to the Home Depot plumber, here’s a tip, if ya don’t want to be playing Plumbing 20 Questions answering my idiotic weekend DIY-er questions, don’t work at Home Depot where idiotic weekend DIYers like me go to ask idiotic weekend DIY-er questions, Ya Jagoff! !